With only five games remaining in the 2010-11 regular season, the Stars will open this weekend at home on Friday night against the Muskegon Lumberjacks, and then finish off the weekend on the road against the Sioux City Musketeers on Saturday evening. Puck drops at 7:05pm on Friday night at the IceBox, and at 7:00pm Saturday night in Sioux City. Lincoln is currently 30-20-5 (65 points), and in fifth place in the USHL Western Conference. At the time of this article, the Stars were only 3 points out of fourth place, 4 points out of third place, and 5 points out of second place in the wild, wild west. Click here to see the current USHL standings. Click here to listen to Stars radio announcer Mike Melbye call the games on AM 1480 KLMS. You can also watch the games via B2 Network by clicking here. If you want to follow the Pointstreak boxscores, click here. The Stars will play their second to last regular season home game this Friday night against the expansion Muskegon Lumberjacks (23-25-8, 54 points, fifth place in the USHL Eastern Conference). This will be the second, and final time these two teams will face each other, and it will be the only time the Lumberjacks visit the IceBox this season. 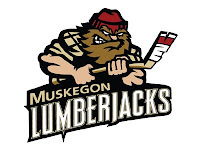 In their lone previous encounter on in Muskegon on 2/9/11, the Stars were victorious by a score of 5-2. In that game, Lincoln scored two shorthanded goals, and out-shot the 'Jacks, 30-19. Speaking of shorthanded goals, the Stars and Lumberjacks are tied for first in the USHL for shorthanded goals scored. Both teams have scored 10 shorties on the season, although the 'Jack have given up a whopping 19 shorthanded goals against, while Lincoln has only given up 5 SH goals. The Stars are traditionally the most penalized team in the USHL over the last few years, but the Lumberjacks have taken over that top spot with a total of 1,475 penalty minutes, compared to Lincoln's 1,231 minutes. The top two penalized teams in the league will meet this Friday, so you never know if fireworks will fly. It could turn out to be a very exciting game. On Saturday evening, the Stars will travel to Sioux City, Iowa to begin a mini two game series against the Musketeers. The two teams will face each other again in Sioux City next Tuesday night, on 4/5/11. The Muskies are currently 27-22-6 (60 points), and are right behind the Stars in sixth place in the USHL Western Conference. The game Saturday night will be the seventh time the Stars and Muskies meet this season. In their previous six head-to-head contests, the Stars have a record of 4-2-0. In their last meeting at the Tyson Event Center in Sioux City just a few weeks ago on 3/5/11, the Stars were beaten badly by a score of 6-3. If the Stars are one the hottest teams in the USHL right now, having won five in a row and seven of their last eight coming into this weekend, the Muskies aren't that far behind. Like the Stars, Sioux City is riding a five-game winning streak at the time of this article, and have also won seven of their last eight games. After a slow start, and an inconsistent season, the Muskies have really turned it on as of late, and they are firmly established in the western conference playoff race. Both teams are playing their best hockey of the season right now. Remember, Friday night at the IceBox is the Stars' "White Out Against Cancer" night to benefit the American Cancer Society, so make sure you wear something white if you don't already own one of the white out t-shirts the Stars were selling the past couple of weeks. Don't forget to contribute to the "Buzz-Cut Competition," and stick around after the game to bid on the special game-worn jerseys. Bring your checkbook, plastic, and/or cash and donate what you can for a great cause. Also, don't forget that the Blueline Booster Club is still selling "LIVEHOCKEY" bracelets, hats, and car magnets to benefit the Leukemia & Lymphoma Society . You can buy those items in the BLBC booth located in the south concourse area of the IceBox. I have been told that once this season is over, the BLBC will not have any more "LIVEHOCKEY" items to sell, so get them now. Should be a great night! It's already a sellout, so I hope you have your tickets! See you all there. Stars got a LOT of help tonight from the Des Moines Bucs who beat the Fargo Force by a score of 3-2. Bucs scored a PP goal with only 1 second remaining in regulation to win the game. That's a HUGE break for the Stars. Lincoln is still only three points behind Fargo for that coveted 4th seed in the USHL Western Conference playoffs. Fargo only has three regular season games remaining, while the Stars have five game remaining. Just a reminder for those wanting to watch and/or participate in the jersey auction after the game. You will be able to sit in either the new Mutual of Omaha Bank Zone, or in the Galaxy Club. #7 s. city vs s.f. we end with 2 games vs tri city..
hope everyone plans on the road trip to kearney to cheer on the team!!!! its got to be good to be a STARS fan from around the WORLD! !